This chapter introduces the concept of metric power. It begins to contextualise this concept by exploring its links to contemporary expansions in the data assemblage. 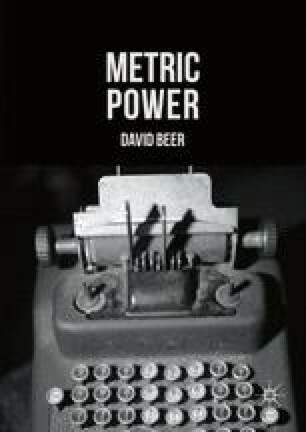 It then focusses upon the role of metrics in relation to questions of power, governance, and social ordering. It does this through an examination of the concept of neoliberalism. The chapter argues that metrics can be understood to be the means or mechanisms of the realisation and spread of neoliberal forms of competition. It then concludes by outlining the direction and structure of the book, most notably in relation to its focus upon the relations between measurement, circulation, and possibility.